Make your fish jar more colorful and realistic! Create a dreamy atmosphere for your fish! 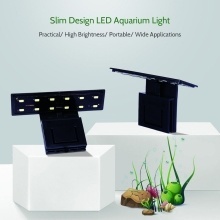 Equipped with energy-saving LEDs, this kind of portable aquarium light is easy to use and carry and helps to accelerate the growth of water plant. What are you waiting for? Just buy and enjoy! High luminance and high brightness, energy-saving, endurable and cost-saving. Easy to operate, just plug and play, no extra operation, user-friendly. The thickness is only 0.3in, free up for more viewing space, mini in size and light in weight, easy to carry. Superb LED beads, flicker-free and anti-glare light without strobes and radiation, it can keep your eyes away from exhaustion, long lifespan, low degradation, good heat dissipation. Be excellent for aquarium, fish jar, pool and other similar occasions. 1. This light is non-waterproof, please use it carefully. 2. The maximum clamp clip range is 6mm.